The GW men’s basketball team remained in a tie for first place in the Atlantic 10’s West Division with a pair of weekend conference victories over St. Joseph’s and Dayton. Two days after the Colonials blew out St. Joe’s at home, Dayton took GW down to the wire in the team’s third nail-biter in the last four games. GW (16-6, 10-2 A-10) moved into a three-way tie for the best record in the conference with Xavier and Temple after the Musketeers handed the Owls their second A-10 loss Sunday. Point guard Shawnta Rogers once again led the Colonials, averaging 27.5 points, 6.5 assists and 4.5 steals in the two victories. Rogers still leads the A-10 in all three of those categories. He is trying to become the first player ever to lead the conference in all three statistics. 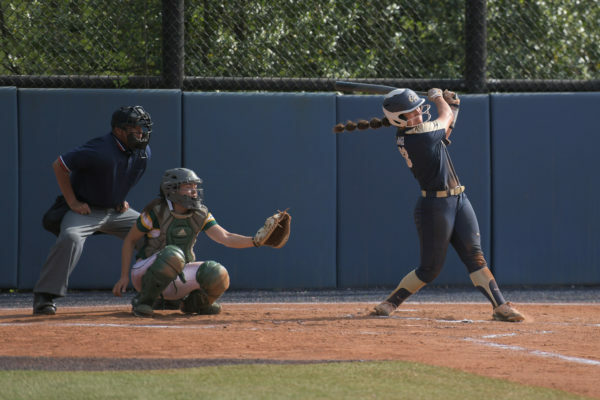 With the season’s end approaching, GW head coach Tom Penders had his team prepare for the two games like it was the postseason. The Colonials have won 11 of their last 13 games and return home Wednesday at 9 p.m. to take on Massachusetts before traveling to Temple Saturday. A week earlier, senior Seco Camara threw up an airball on a three-point shot that would have given GW a win at Virginia Tech in the final seconds. Camara found himself in a similar situation against Dayton Sunday. GW led 66-65 in the final seconds when Shawnta Rogers penetrated the middle of the defense and dished the ball back to Camara at the top of the key. But this time the ball found the bottom of the net. Camara’s three-pointer with 7.9 seconds remaining iced the game, and the Colonials prevailed against the Flyers at UD Arena. GW had a nine-point lead at 64-57 when Dayton started cutting into GW’s advantage. A bucket by Coby Turner and a pair of free throws by both David Morris and Mark Ashman trimmed the Colonial lead to three. Yegor Mescheriakov extended the lead to 66-61 with a layup after collecting a loose ball, but a defensive lapse in transition by GW allowed Dayton’s Yuanta Holland to score uncontested. Dayton trimmed the lead to a point at 66-65 on a fine interior pass from Ashman to Holland, who laid the ball in and was fouled by Mescheriakov with 1:39 remaining. But Holland missed the free throw that would have tied the game and neither team would score again until Camara’s three-pointer. Rogers was the difference once again for the Colonials, scoring 29 points to lead all scorers. The game was tied at 37 at halftime, before Rogers took over at the start of the second half. The Colonials quickly fell behind 42-39, but a pair of three-pointers by Rogers and one by Mike King gave GW a 48-42 lead. King finished with 15 points and Mescheriakov ended up with 10. Foul trouble hampered both players, sidelining them with four fouls for long stretches in the second half. Dayton (9-13, 4-8 A-10) was without its leading scorer, Tony Stanley, who was benched for violating a team curfew. To pick up the slack, five Flyers scored in double figures, although no other Dayton player got in the scoring column. Dayton stayed in the game by taking away what are usually GW’s strengths. On average the Colonials turn the ball over six less times than their opponents, but GW had just a 17-14 edge in that statistic. GW also normally dominates the offensive glass, but Dayton had 17 offensive rebounds to GW’s 10. Although St. Joe’s was in the middle of a seven-game losing streak, the Hawks had been playing better than their losing record showed. In their three previous games, the Hawks had lost to Xavier by six, fell to UMass by just one at the Mullins Center and were beaten by seven against Temple. So the Colonials’ 24-point blowout at the Smith Center Friday came as a surprise. Martelli was referring to Rogers, who scored 26 points, including five three-pointers, dished out eight assists and made five steals. Mescheriakov was just as impressive, scoring 28 points on 10-of-19 shooting, including 3-of-5 shooting from behind the arc. “It’s a critical part of the season, and it’s definitely time to step up now or never,” Mescheriakov said. GW’s defense also stepped up in the game, forcing 30 turnovers – a number GW equaled in its season opener against George Mason University. “You take away their turnovers in the first half and they were hot and giving us some trouble, but we were able to turn them over,” Penders said. The Hawks stayed with GW for much of the first half, as the game was tied at 25 with eight minutes to go in the period. But the Colonials went on a 20-4 run started by sophomore Roey Eyal’s long jumper from the top of the key and three-pointer from the right baseline. Mescheriakov, Rogers and freshman Andry Sola also hit three-pointers during the run, as GW jumped out to a 45-29 lead. St. Joe’s (9-15, 3-9 A-10) closed the margin to 58-50 early in the second half when Rogers silenced the Hawks. With 12 minutes to go, he forced his way inside and hit a fade-away jumper from just inside the foul line. He scored GW’s next six points on three-pointers, and assisted on the next two scores by Francisco de Miranda and Mescheriakov, as GW pushed its lead to 71-54. Patrick Ngongba put together a solid performance for the Colonials, scoring 10 points to go along with six rebounds and three steals. King contributed 12 points, eight assists and six steals. -Fred Sakai contributed to this report.